When I moved in I bought an IKEA Ramvik table and while travelling this summer I had an idea (don't ask why): decorate its top with Lego bricks used as pixels. Here are the steps I went through. If you don't care about those steps and want to see a nice time-lapse video, scroll to the end of the article! First things first. What are the Lego brick sizes and colors available? Oddly enough this question is not that easily answered. Probably because Lego's site is crappy, or because nobody really cares... I eventually found Brickipedia which happens to be a much richer resource than the official ones. Everything I was looking for was there: the Lego "unit" is 8 millimeters and the color palette is pretty simple. Knowing my table size I had various options, depending on the "pixel size" I'd choose. Of course the number of bricks (and the price) would also vary. So I created a dynamic spreadsheet on Google Docs that'd do the calculations for me... Here it is, with all the options possible (French, sorry). I chose the 4x4 option, quite cheap and still offering a cool number of pixels. 36x16 pixels of freedom, that's it. I tried lots of different designs, from lo-fi photos to pixel-art drawings. I decided to go for a Heavy Oblique Futura. You may notice that Lego's black is a little bit light and the grays are yellowish. Already? Nope, not that fast. Before ordering I had to know exactly what to order, that means counting the pixels. Well, I'm not this kind of guy. I'm a developer; I hate repetitive chores, you know. 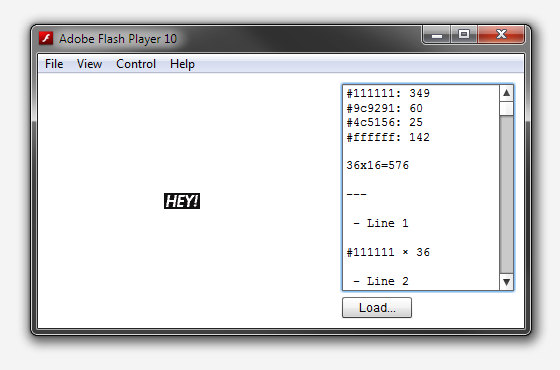 So I fired up Flash Builder and came up with PaletteCounter a simple, OpenSource, app to count pixels of each color. I also added some kind of "assembly instructions generator" to help us build it. Handy. Really? Yup. I placed an order on lego.com's Pick A Brick and received it a couple of weeks later. Yay! I'm not going to describe the process (that happened this saturday), just have a look at this time-lapse vid. 1020 pics shot in about an hour, yummy. Thanks to Céline and Julie for helping out! This page has been translated in Russian by Karina. Posted on November 1, 2010 under Dev,Visual. This post is tagged as, flex, font, photoshop, real-life, typo, video	and has 42 comments. Well done, you get ‘coolest thing I found on the web today award’ – not just for the table idea, but for the accompanying geekery and super-clear description and links. And yes, I would love the PS/lego color tables! This is one of those things I have thought about doing but never quite got round to – thanks in advance for the info (oh, and also for your cool screenshot app – http://toki-woki.net/p/WebKut/ )! Merry Christmas! Just added links to a live version of PaletteCounter and to the ACT (Adobe Color Table) files! Totally awesome- much respect for the idea and implementation! How much did this cost you in lego bricks though?? I chose the 4×4 option, so it cost me around 90€. I also ordered some extra bricks just to be sure! Woo- thanks for the fast reply- I’m going get my design chops out and starting shopping now! Anyone wanting to take on a similar project should check out Bricklink.com. Individual sellers with a much better selection of parts and colors than Lego’s own Pick-a-Brick. And usually at cheaper prices too. They can be very knowledgable too, with help and links for creating mosaics, etc. Could I also ask what song you used for your video? Thanks! The track I used is called Vordhosbn, by Aphex Twin and it’s on Drukqs! Hey! Fantastic idea! I have some questions about the coffee table. How much vertical space is there between the top panel and the glass? Thanks! Thanks! Well I can’t really answer since I now have the Lego layer in between… But if you remove the 4 little bumpers at the corners (which I did) and put the Lego layer between the table top and the glass, the glass will be around one millimeter above the table’s frame (something you don’t really notice but is worth mentioning). Thanks, this is helpful! I was thinking it might be interesting to try using two layers of bricks (probably using flat bricks). Since there aren’t any regular Lego bricks in the 4×4 dimension i’m pretty sure he used flat ones -> Plates. You’re absolutely right! I didn’t specify it, but yes, I used plates! This is a really cool idea, though I’d be interested in trying out other Lego designs in the tabls. Ah, bien je ne connaissais pas tout ça, bien joué pour la table ! à demain du coup. Par contre je ne me suis pas limité à des pièces de 4×4, je suis parti sur une base de 1 pixel = 2×2, mais en réunissant pour chercher les pièces ayant le meilleur ratio pris/pixel. Cela m’a permis de bien réduire le prix final, mais j’ai rencontré un petit inconvénient: certaines pièces n’ont pas des dimension parfaitement proportionnelles, résultat, j’ai du en limer quelques unes et laisser du jeu par endroits. Je suis vraiment très content du résultat, merci beaucoup pour cette idée. Great work sir! Thinking of biting your style but maybe trying “YO!” instead. Why had you put a plastic film under the lego bricks ? What kind of film had you used ? How do you prevent brick from moving ? The plastic film is cover film (for books) and I use it to glue all Lego bricks together. I guess this answers all your questions! What’s it like to clean, between all the lego round heads? Never had to it since I kept the glass part on top of it! It would be a lot more work, but you could come up with some sort of “best fit” algorithm that would allow for the larger plates in areas of solid color, and then working down to the 1×1 (or 1×4 strips, etc.) for the edges. This would give a higher “resolution” look to the table. You could even do this as an upgrade to the existing table by re-rendering it at the higher resolution, and creating a list of 4×4 tiles that you’d need to replace with smaller pieces. brilliant, love the idea & how you’ve done it. 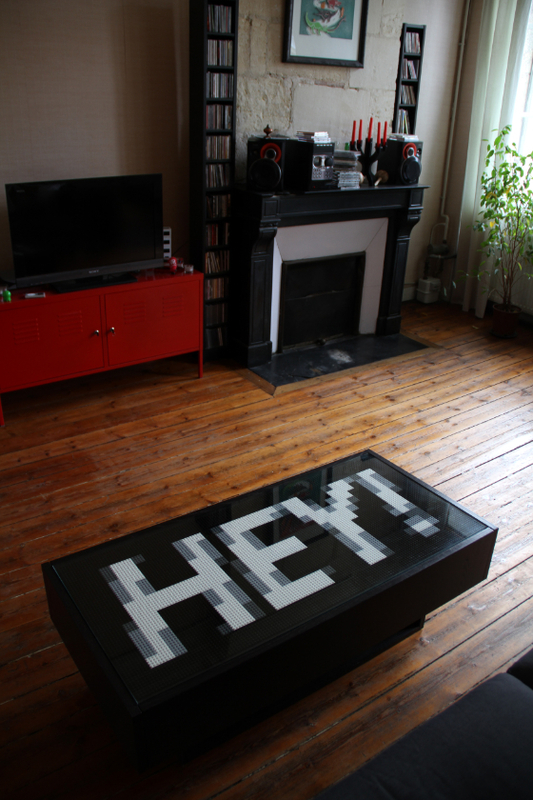 Céline Roche > Blog » Table LEGO® HEY! DIGITAL DENTIFRICE » Toi aussi crée ta table de Hipster Lego ! Bat DNA » HEY! – LEGO可以这样玩! Turning pixels into LEGO pieces | You've been blogged!